We, the undersigned, Auriea Harvey and Michael Samyn, were invited by Foam to collaborate on the prototyping phase of a multiplayer game that is part of the groWorld project. In our day-to-day artistic practice at Tale of Tales, we research the potential of games as a means to communicate, convey meaning, evoke emotions. We do this by creating games and releasing them to the audience. The themes we choose to work with are highly personal. But we often interpret existing stories such as fairy tales, myths, legends and religious texts. As artists, we are more interested in the diversity of meanings that players can derive from our work than in transmitting any particular message. The groWorld project required us to work within a team set up by Foam. As such, any ideas and designs needed to be adapted to what the group was capable of and willing to do. This is an unusual way of working for us, as we generally choose our collaborators for very specific tasks within a specific project. But we understand that Foam is interested in process as well as product. And as such, the project also seemed like a psychological experiment where the social interactions between the participants were as much part of the project as the actual artistic output. At Tale of Tales, we want to awaken the beauty that lays dormant in the interactive medium. We believe the wide field of video games carries the potential of becoming the greatest art form since oil-on-canvas, overshadowing any success of cinema in the previous century, as Western culture's cultural centre. We believe the interactive format is superbly suitable for addressing the complexity of our post-historic societies. We believe that Foam shares a lot of these sensitivities. The difference in our approach is that FoAM adds to this a social/political agenda. In addition to influencing the feelings of individuals, FoAM researches different ways to directly affect changes in society. Foam is strongly interested in open source software. We are indifferent. We consider computer technology to be extremely primitive and we will try to use any tool that seems more suitable to get the job done. We don't like capitalism either but we don't mind paying for software or having no access to its source. If it's designed well, we appreciate it. Since the confrontation with an audience is so important for us, distribution of our work is a vital component of our practice. We offer our games as downloadable packages via the internet. But we also actively engage the commercial games industry by selling our games, on popular gaming platforms for instance. We do this in part because we want to create a relative independence from government funding, by earning our own money, and because we hope to establish in a “punk economy” where suppliers and consumers simply work together without the need for middle men like museums, galleries, publishers or supermarkets. We also sell our work to force the games press to take it seriously. This way we hope to influence the attitudes in the gaming audience and other game developers. The commercial exploitation of the groWorld game has always been an option, but not a necessity. We can live with that. We think it is good to offer artisanally made software for sale to an audience next to the consumer goods, so they can really think about the difference. But we have also been known to just give things away for free. It feels nice. The field of inquiry for this project, for us, is the research into the evocative potential of interactive media. How can a technological artifact help a person think, experience an emotion, generate ideas, connect to other players? Specifically emotions and ideas that are not generally focused on in interactive entertainment. As such, the work shares some affinity with the games created by thatgamescompany, Ice-Pick Lodge to some of the artistic software created by artists such as Lia. The idea was to create a prototype for a multiplayer game in which everyone plays a plant. This is at once a humorous plan that parodies traditional MMOs (Massively Multiplayer Online games) as a serious attempt to evoke emotion and stimulate thinking. The groWorld game wants to make the player feel as if they were a plant, and to somehow connect to other players in that state. Games can be used to allow people to experience another reality. Next to the amusement caused by the whimsical nature of the absurd idea of playing a plant, we were hoping to create a meditation tool of sorts that allows people to discover and consider the ways in which plants live, grow and co-exist as inspirational for the ways in which humans might improve their own existence on this planet and co-existence with it and each other (and with plants). The idea was to create a single multiplayer prototype that could be released to the public to further inspire the design. The problem was mostly defined in physical meetings where we discussed the themes of the project, the design of the game and the technology we were going to use. In a second phase, texts, drawings and software were produced by individuals or small groups. During this phase, work results were shared and discussed among the larger group -mostly via a mailing list. One person's work often influenced another person's. There was a strong desire to come to a certain common idea. Towards the end of the project, the individuals and small groups focused more on their own work, in order to produce things that could be presented to an audience. The subject matter of groWorld is vast and complex. The people who make up the production team are strong-willed individuals with diverse skills and talents. Demonstrating our ideas about the project in actual texts, drawing and software seemed more efficient for the core development team, than trying to explain things and discuss them. A brainstorm discussion of the project lead to several ideas and inspirations. One of the strongest ideas was the desire to create a game in which you feel like a plant, experience life as a plant and perhaps learn from the plant's existence ways of improving our lives as humans on this planet. There's two attractive aspects to “playing a plant”: one is letting going of individualism (no longer thinking of yourself as a single unit separate from others or your environment) and the other is the idea of a sort of unconscious or subconscious life (dubbed “the vegetal mind” during the meeting, i.e. a state of life where everything you do is instinctive, where, in other words, you are fully connected with your environment). The outcome consists of texts, drawings and several prototypes, created by different team members. Our concrete contribution consists of three computer programs: a 2D root growing game, a 3D avatar demonstration and a 3D garden exploration. The first idea that came to mind when thinking about making a game with plants, was an older one. This idea was documented in our personal wiki as “Plant Simulator RPG”: You play a plant. Gameplay is a combination of level-up-RPGs and Sim City. You manage your resources (soil, air, sun, water) and decide to grow leaves or flowers, longer stems, larger leaves or more of them. If your flowers are attractive enough, the bees may help you multiply. Perhaps players can influence or even design the look of their petals and flowers. Maybe this can be set in a multiplayer environment, a garden filled with flowers. Play a plant. Use nutrients from soil and air to grow leaves and flowers. Attract bees and butterflies to grow new plants. And fly on the wings of a butterfly to see the plants of all the other players in a beautiful online garden. Massively multiplayer game where everyone plays a plant. Together you form a gigantic virtual garden. With nutrition from the soil and the air, you develop branches or leaves or flowers. If your flowers are big and beautiful, the bees will help you procreate and make the garden even prettier. You start as a little plant, or a seed even. You grow bigger and bigger. Then you procreate and you're essentially controlling multiple plants. A first prototype was built based on this idea. There's two types of resources: sun and rain. When it rains, sun energy diminishes, when the sun shines rain energy diminishes. Rain energy can be used for stems and leaves. Sun energy can be used for flowers. Stems, leaves and flowers have different types of buds. Click on them to make them grow. Buds only appear when sufficient energy has been gathered. Leaves speed up the accumulation of sun energy. The simplification of the natural context (sun and rain for energy) in this prototype is quite appealing, even if it is far from realistic. 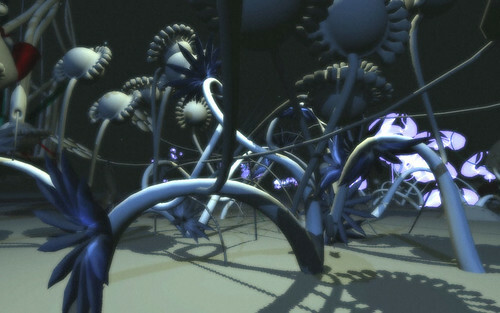 Disadvantages of this prototype are the random shape of the plant and the all too direct control by the player over growth, creating an emotional distance between player and plant, where the player feels more like a gardener than a plant. To solve the problem of feeling like a gardener when directly manipulating plant growth, we came up with the idea of focusing on the roots as the “control center” of the organism. We imagined a kind of hi-tech factory with an pseudo-technical abstract look that you would control as a manager of sorts. Or it could be a sort mining operation where digging tunnels in search of nutrients would represent the growing of roots. Rather than interacting directly with the environment, we imagined a group of minions doing the work for us and thus creating a sense of autonomy in the plant (i.e. nature running its course). We realized that there is already one type of game that is capable of “reducing the player to a plant”. It's the mindless casual game that is so popular with web savvy senior citizens. Perhaps we could come up with a match-three class mechanic, the outcome of which would produce a plant. When thinking of simple software systems to grow roots in 2D, we stumbled on the hexagonal grid. Hexagons have been a staple for a certain type of strategy games, so it sort of felt right. We started prototyping a root growing game with hexagons. The abstract nature of the hexagon shape also connected well to our desire to make a hi-tech underground factory. The mindlessness of the early hex prototypes was extremely satisfying for some members of the team, while others found that it too mechanical and distracting. But the lack of aesthetic connection to plants (apart from a vague abstract representation of root growth) felt uncomfortable. When Dave introduced us to a way in which textures on a hexagonal grid could be used to represent roots more naturalistically, we found a means to correct that problem. While Dave was creating the gameplay underground, we decided to work on what would happen above ground as the result of this root growing activity. We felt that one of the important motivators in the social experience of the game, would be the plant avatars that each players would be growing. So we came up with a system to represent how these plants might look. And how a garden would look comprised of such plants. The concept of our garden was that each player was represented by a basic shape that grew out of the ground surface and was made from the same material (we were imagining white ceramic for the prototype). So plants and world are one. This basic shape would grow according to algorithms that were specific to its species. But no two players would look exactly the same. This growth would happen very slowly (years). Next to the basic element that is specific to the species, every plant would be able to grow attachments based on nutrients found by the roots in the soil. These are like leaves and flowers, except that every plant is capable of growing every type of attachment. So the attachments are not species-specific (but they could be location or time specific). This kind of growth is faster (seasons). When below ground, the player would be playing from his plant's perspective. Above ground, the player gets full control over the camera to roam the garden. We did not succeed in making a single prototype that could be tested on an audience. Instead we created numerous smaller prototypes that can inspire further design. The main reason for not creating a single prototype, in our opinion, was the lack of a singular vision and goal. Several people in the team thought that it might be better to test out different ideas in smaller prototypes, rather than putting all our eggs in one basket. There were too many voices and too much democracy to get to a single result. If the project wants to result in a single game, it needs a dictator and it needs focus. In our experience, making games independently means reducing their design to the bare minimum. Foam's “expansive” philosophy does not seem compatible with this principle. A team of interesting individuals with an interest in plant-human interactions was assembled for this project. These people came together to explore different ways of interacting with plants (including gaming, but also gardening and storytelling). Our approach is to first establish a solid core idea and then choose a team members for specific tasks. It helps if the person who establishes the idea is experienced in the relevant fields (games technology and interaction design). The drawings and prototypes are very interesting and inspiring. The next step is to evaluate them with the purpose of using them to help decide what we don't want in the game. This may require removing some elements that we are all very fond of but that may be too complex to develop (or to hard to achieve a consensus about regarding execution). The end result of this process should be an extremely concise game design that is simply wonderful and beautiful in and of itself. This design needs to be executed. Then, based on that execution, perhaps the previously removed elements can be added. But probably not, since, in our experience, such a prototype tends to inspire new things. For this plan to work, in our opinion, a single person (or tight small group) needs to get the authority of final say in any design decisions. It is best if this person is also the experience vision holder mentioned above. The other members of the team need to accept this person's leadership and agree to work towards that singular vision. At the end of this phase, we were a bit disappointed that we didn't really have a clear idea of the kind of game that we might want to make. To help get to that point, we would suggest the following. The user's experience is more important than the artist's message. All of our ideas should serve only as inspiration. Our focus should always be on how the player feels when interacting with our game. Not on whether or not we are expressing our ideas well. If the game ends up being about something else, that is fine too. We're not making edutainment. We should take the interesting elements from our prototypes and optimize them. When producing games, trying to implement all ideas is a recipe for failure. It's important to make choices and to have a reductionist approach to game design and features. Choose one idea and make a game with it. Not necessarily because the others are bad but because you need focus in order to finish something. Our philosophy is “It's better to make something than nothing”. To our mind, the best idea for a game that came out of this phase is a dual game of being in a plantlike mindset when playing (underground) and showing off your plant avatar as a human (above ground). We would remove the concept of plant guilds and the first person perspective. As per above, we don't need any reasons to remove things. Reductionism is the reason. The plant guilds feel a bit too anthropomorphic to us. It feels too conscious and may lead to too deliberate strategic gameplay as in a World of Warcraft-like leveling MMO or a sort of “Sim City for plants”. The first person view seems redundant because a plant is not a person. Also, we can't really come up with a solution for the confusion that Dave's first person prototypes cause in us when playing. Sadly, perhaps, the idea of being a growing seed seems too difficult to express. One thing that we feel is missing from the game idea is a feeling of accomplishment for the player, a reason/motivation to play. Satisfying this desire is somewhat at odds with the vegetal mindset that we're aiming for. Which is why we want to represent this aspect above ground (the human part of the game). The motivation to play would thus be human and consist of showing off your plant, trying to make something pretty and care for the organism that you're creating. There is no interaction. There's a persistent ongoing world “out there”, somewhere, on the internet. Things happen in it (rain, sun, nutrients, magic). If you are present, your plant can absorb these and evolve, grow, change. If you're not present, your plant slowly dies. You can be “present” in many ways. Dial a phone number and listen to the silence. Send an email. Hang out on a website. Run an application that depicts your roots in some way. As long as you clearly give some attention to the game, your plant will be affected by things that happen in the world. In this mode, you only ever deal with your own plant. The multiplayer aspects happen exclusively above ground, in the garden. There's no interaction there either. And you're not the plant. You can just fly over the garden and look at the results of everybody's playing. The social aspect simply comes from the way you've made your plant look. And admiring other people's creations. Or seeing other plants whither when their player is absent too much.